If ya actually look through this, excuse me ahead of time for relative long-windedness; I was just really excited when they threw this program up on crunchyroll, and I think this show really merits viewing for multiple reasons. Arakawa Under the Bridge operates, for me, on both the thematic and comedic levels. The relationship between the main character, Ichinomiya Kou, and the community of eccentrics by the Arakawa is, in my opinion, an interesting and surprising exploration of capitalism and communalism as it impacts people on the individual level. In Ichinomiya we are presented with the capitalist reified, born of a great conglomerate and into a family of economic expectation. His father was a businessman, and he will be a businessman. But Ichinomiya doesn't just have the money and connections - he comes loaded with an ideology that is not directly about capital (or even frugality) as it is about self-reliance. Kou's self-reliance is so hyperbolic that it at first just appears to be a joke. But it's not just for comedic effect - by tying a man of money to a ridiculous ideology of self-reliance, the show is engaging in a rather smart satire of the logical moral conclusions of neo-classical capitalism. While taking a page from Weber and Durkheim, Arakawa Under the Bridge quietly suggests that the self-reliance and individuality that has permeated capitalism since the Protestants is actually a socialized ideology of conformity; that, ironically, true individualism is actually achieved when bolstered by a community. The individual is not suffocated by group solidarity, but is forged by it. In this show, the self-reliant person is a joke, a papa's boy, while the true individual is a part of the community. That's one-half of what draws me to the show. The other half is that it's damn funny. Directed by Shinbo Akiyuki of Bakemonogatari and Sayonara, Zetsubou-Sensei fame, the show slaps you over the head with absurdist jokes, camera pans, and character designs. Each character has a wild personality that just adds more fuel to the fire, and some of the referential material (I suppose being almost all the material) flies close to inspired. Theme aside, it's just a funny show for anyone who's bonkers for references, visual humor, and kappas. Granted you like crazy shiz, there's only one downside I can foresee, one that's been remarked upon before; the characters. Don't get me wrong; they can be damn funny, and Hoshi has got to be one of my favorite comedy characters of any anime, if not any show. But if you're looking for a more emotionally enriching experience, don't bother. Kou's the only bloke who gets serious development, at least in the first season, and I mean that literally - he's the only person. This is in spite of the fact that some characters are truly intriguing. I found myself wishing for more on Nino (the blond beside Kou in the poster), as her hints speak to a fascinating psychology and backstory that could have served a great foil to Kou's own evolution. This show is really more of a 4.5 than a 5, but that's quibbling, and why knock a good thing? I think it's intellectually interesting, and it's damn funny. Give it a shot - I bet you'll like it too. Force an elite, rational, intelligent, and successful man into an environment full of homeless people living under a bridge who lack common sense, stupid, and full of fails in life and you'll have yourself one of the best anime comedy of all time. 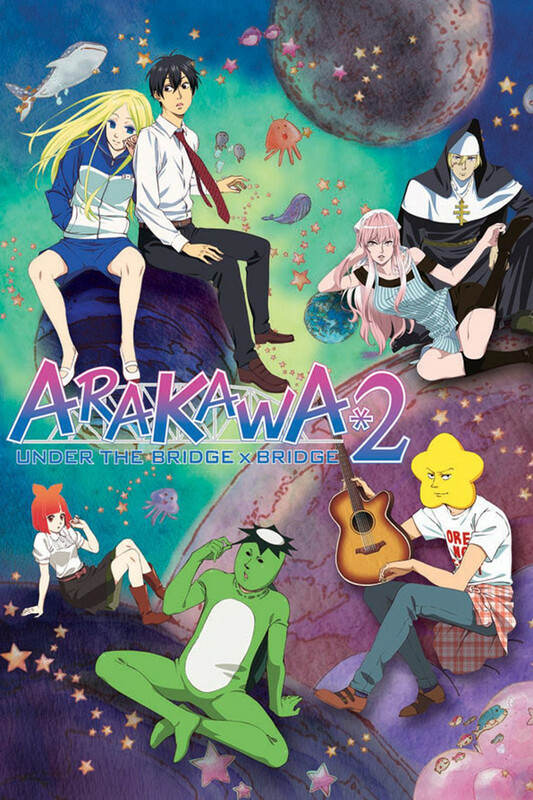 Arakawa Under the Bridge features familiar voices such as Sakata Gintoki from Gintama, (The legendary Sannin) Jiraiya from Naruto, and Koyomi Araragi from Bakemonogatari series, (Senjougahara is in it, though uses a different voice). One thing is sure, their role in this logic-forsaken anime is one of their best performance. Arakawa Under the Bridge strength lies in its unfathomable cast who's thinking and behavior knows no boundaries. Their lack of common sense can drive a civilized man like Kou Ichinomiya to his limit. Just look at the cover...Yes. These are people. The Japanese man with a punctual attire is Kou Ichinomiya (same voice as Araragi). He will be the victim of this under-the-bridge-stupidity. The guy with a star head is Hoshi (same voice as Gintoki). Obviously a nutcase. The kappa guy is refer to as chief. Obviously a nutcase. Sister, No. I'm not talking about the pink-haired woman but the big man with a sister attire is obviously another nutcase. Maria, the pink-haired woman. If you're a guy, stay away. She's a nutcase. There are more nutcase! I'll let you discover them yourself. Assume everyone living under the bridge in Arakawa is a nutcase. Only outsiders like Kou Ichinomiya uses common sense. At least, before he was infected with their stupidity. Although Arakawa Under The Bridge sounds stupid, it's definitely not. The cast is stupid but the thinking behind it is smart. You'll only need to see the first few minutes of the first episode to realize that it's well thought-out. Unlike some stupid-based anime, its stupidity is used to make a point; What is common sense? Perhaps no one is stupid but only different perspective and definition of common sense. The biggest takeaway you can receive from the Arakawa Under the Bridge is from Kou's experience. Success is written in his face and takes pride of it—all the time. However, he is really unhappy. Perhaps, success and materialistic products have its merit in life but does not always equate to true happiness. True happiness can be found anywhere and in any point in life even in the oddest places. Perhaps, achieving true happiness could be the greatest form of success in life. Arakawa Under the Bridge manga is still ongoing at a snail pace. This mean after finishing second season, some questions will be left unanswered and some characters left unexplored. Read the manga to continue. If you enjoy straight-man comic setup, this is the anime for you. Its setup is perfect because you have a man with common sense surrounded by people who have none. Just look at the cover. Do they look like normal people? Note: This anime has romance but it isn't the dominant feature. If you're watching it only for romance, there are better options. Beautiful show with lots of comedy! This show was great. I felt like there was a whole lot of deeper meanings under the comedy and the romance, that are very applicable to the regular person. I really loved this show, watching the characters grow, the comfortable mood that makes you want to stay, the great voice acting and animation, and also a quite nice soundtrack. I mean come on, they got suneohair to do both endings. Its a psychological romance comedy worth watching. Funny and unpredictable and also cute. Every character with maybe the exception of nino has some strange psychological issue. Its almost like a semi homeless commune of crazy people. Even the lead character Rec who is arguably the most normal has some issues that I am sure a psychologist would love to take a look at and his are nothing compared to the rest. Its basically a crazy cake of funny. The whole thing blends perfectly. If you like psychological romance comedys with a twist u may like this. Coming from other Shaft/Akiyuki Shinbo shows such as Bakemonogatari, Madoka Magica, and Mekakucity Actors, I came into this show with rather high expectations. While this certainly won't go upon the top of my list of favorite animes, it was still rather enjoyable and will have a special place in my heart. The first few episodes are spent introducing you, and the main character Rec, to the other characters and the setting that you'll continue to see for the remainder of the show. These episodes weren't quite as enjoyable for me, but towards the latter half, I got into it more. This series accentuates on its eccentric characters, and their abnormal reactions to otherwise normal things. The dynamic of these characters really do well to make it entertaining, and the continual introduction of new scenarios, events, and characters keeps the comedy going. The romance element between Rec and Nino is also really enjoyable to see, and it's nice to watch how their relationship grows as the series goes on. Arakawa Under the Bridge x Bridge, the sequel, has episodes that are a bit more coherent, and aren't quite as haphazard, but they still keep the random and eccentric humor of the previous series within each scene. For me, this sequel was a lot more enjoyable. The art style, while more plain in comparison to Shaft's more famous works, is fitting for this anime, and is good. However, it wouldn't win any awards. Where this series really shines, from a production standpoint, is its unique and memorable music. The background music does really well to add to the scenes, and are additionally fun to listen to on their own. The ending themes, and second opening, I also really enjoyed. This is a pretty good comedy series, and if you do have the time and interest in it, I would recommend it. Don't really expect to be drawn in within the first episode or two though. Is this show under rated or something? Like, seriously dude! I don't see as much comments and reviews in this one compared to all the other one when this should be clearly up there. Iono.. I mean yeah, this show comes off as super bizzare at first (and throughout the entire series) but thats just one of the many joys about this anime. You can never let your guard down when youre watching this because somethings bound to come up. W/e Im only doing this to give it a good rating. Just putting this in for more reviews; Great anime, better than a lot on CR should really get more than most of the small 12 episode Animes i've seen. Really deserves more, pretty hilarious and just a good one to say you've watched. I approve this anime. I'm totally in love with this anime. It has that awkward comedy charm, and everyone's greatly different personalites make for a good mix. You owe it to yourself to give it a few episodes. This is a strange one and you can clearly see that it's done by SHAFT but that's what makes it so good. The black/dark comedy in the show is brilliant however it also has a lot of deeper meaning to it. This series makes you question a lot of values in our society and shows you what's really important in life. I hope they make a 3rd season to the anime .I'm planning on starting to read the manga version. I also want to see the live action movie version to it. I'm glad Crunchyroll added this anime to their catalog. It hasn't even been a week since it was added and I already finished watching all 26 episodes. Thats how good it is.